Father’s Day is celebrated all over the planet at different times of the year. In our little corner of the world your dad’s holiday is coming up this weekend, on the 17th of June. Fathers often don’t get the credit they deserve, so this year it’s time to change that. There’s nothing sweeter to them then spending time with their kids and knowing their children appreciate them. Dad can be hard to buy for, but if you think you’ll never find a gift for him, think again. The Flower Pot has tons of daddy-oriented gift options he’s sure to love. What dad doesn’t appreciate good craftsmanship? 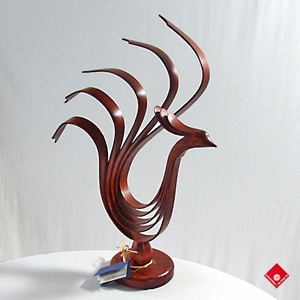 The highly glossed Wooden Bird Sculpture comes in different sizes and is handmade out of oak by Pierre Alarie, a Québec artist. Flowers aren’t only for girls. Your father is sure to love the visually interesting Jazz bouquet with its tropical flowers and particular design and shape. You can even choose to send it with a box of tasty chocolates.